Sarah Palin said she had a "higher calling" that required her to resign 17 months before her term ended as governor of Alaska, and not to seek a second term. "Sarah. I am a patient God. But, you have tried my patience. You are an embarrassment to my ideals, to yourself, to the people of your state, and to your country. Me, and my wolves and moose, would like you to please resign and devote the rest of your life in spiritual embrace of a better life. Oh, by the way, I knew a Sarah, and you are no Sarah." With George Bush back in Texas (for good, by his own admission) The Dubya Report's mission is changing slightly, to monitor the conservative movement and its paradoxical efforts to reach Karl Rove's "permanent majority" in the face of egregious evidence that its ideology has failed. Of course we'll still keep an eye on the fallout from one of the most disastrous presidencies in history. Returning visitors will notice a few changes in our appearance. We're now powered by the Drupal content management system. Many of the familiar features are still available, either from the menu at the left or the right. And as you can see, the search facility has been moved to the home page.We'll be making more changes over the next few weeks. 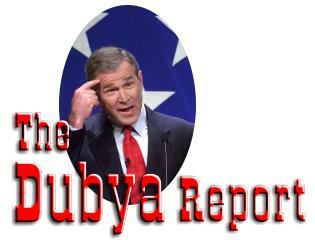 So to new visitors, welcome; to returning visitors, welcome back; and we hope you'll keep coming back for the news, analysis and commentary you've come to expect from The Dubya Report. On the Republican side you have a candidate who was at the center of a major political/financial scandal that cost the taxpayers billions, who cheated on and ultimately left his disabled wife in order to marry an heiress worth 100 million, many years his junior, who herself stole prescription drugs from the non-profit she nominally headed in order to feed her addiction to prescription painkillers. He chose as his running mate a person who, despite the claim that she is a bold reformer, headed the PAC for the one of the more corrupt members of Congress, lied about her opposition to pork barrel gifts to Alaska, has evidently used her political power to fire on more than one occasion public officials who disagreed with her, or thwarted her will on purely personal matters, and is now parroting Bush/Cheney claims of executive power over the duly constituted authority of the State legislature seeking to investigate her wrongdoing. And this is not even talking about the lunacy of opposing contraception and advocating abstinence even faced with the unwed pregnancy of her 17 year old daughter. On the Democratic side you have the son of a teenage mother who raised him as a single parent, who by dint of superior intellect and drive graduated near the top of the most prestigious law school in the country, eschewed corporate practice to work as a community organizer, and goes on to a life in politics, and has, by all accounts, an exemplary, monogamous family life, who chooses as his running mate a blue collar guy who, after his wife was killed, commuted every night from Washington to Wilmington so that he could tuck his kids in and feed them breakfast in the morning. And the Republicans are considered the party of family values? It makes me want to scream.